My husband and I have really loved the inspirational, family-oriented movies that have been coming out lately. There is so much out there in the media that is demeaning to families and to marriages, that THESE films do just the opposite! Courageous is a film that depicts the real-life struggles of families and marriages, but also provides motivation that these relationships can be long-lasting, strong and worthwhile. This date night idea goes right along with the Movie Courageous and has you making your very own Marriage Resolution JUST like in the movie! WATCH THE MOVIE The first step of this date night is to watch the movie together! I rented the movie on Amazon Prime for $2.99 and then realized that I could have BOUGHT the film for $5.00 and possibly free shipping! What a deal! That is DEFINITELY the better way to go! You can purchase the film HERE . 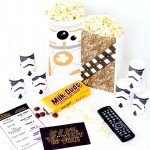 Starting the movie is important because it explains the marriage resolution. 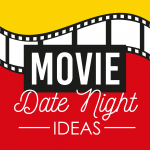 Watching this motivational film alone makes a great date night BUT combine this movie with Erin’s elegant designs from Strawberry Mommycakes, and you have a date night that will really strengthen your marriage! 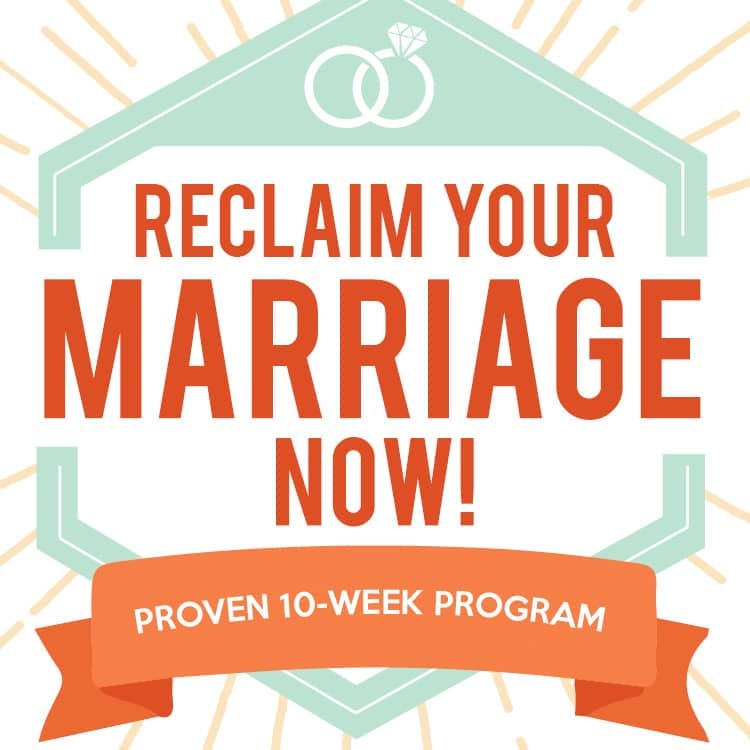 The gorgeous printables are perfect for helping you to start a sincere dialogue with your husband on how you can both recommit and strengthen your marriage. And the best part? At the end, you will have a beautiful display for your home reminding you of your date and your resolve to be better marital partners! In the movie Courageous, the wife tells her husband, “If you are going to do this, then do this right” and they decide that the signing of the resolution should have a formal ceremony. 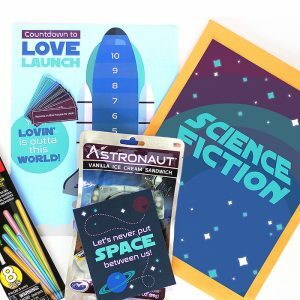 While this date night doesn’t necessarily need to be an elaborate ceremony, putting together a resolution is something special & should be treated as such! 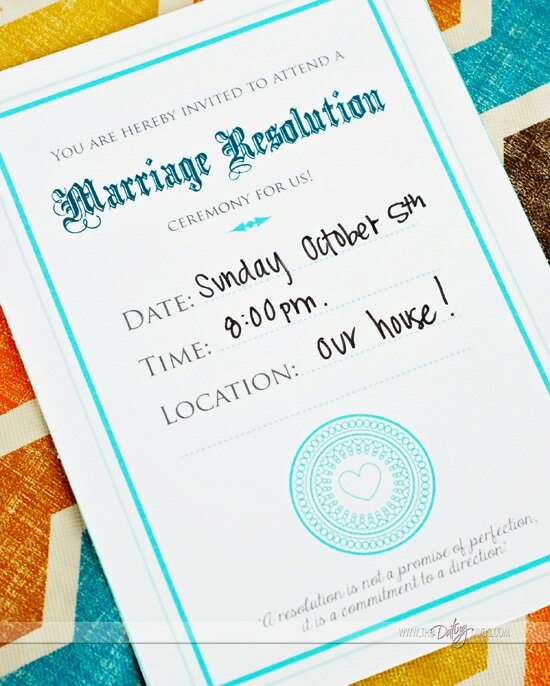 Start by giving your spouse this beautiful invitation that invites them to attend a Marriage Resolution Ceremony for just the two of you! 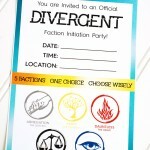 This invite can really set the tone for the evening and let your spouse know that this is important. For your date night, use the Marriage Resolution Question Prompts to start a dialogue with your husband about your vision for your marriage. 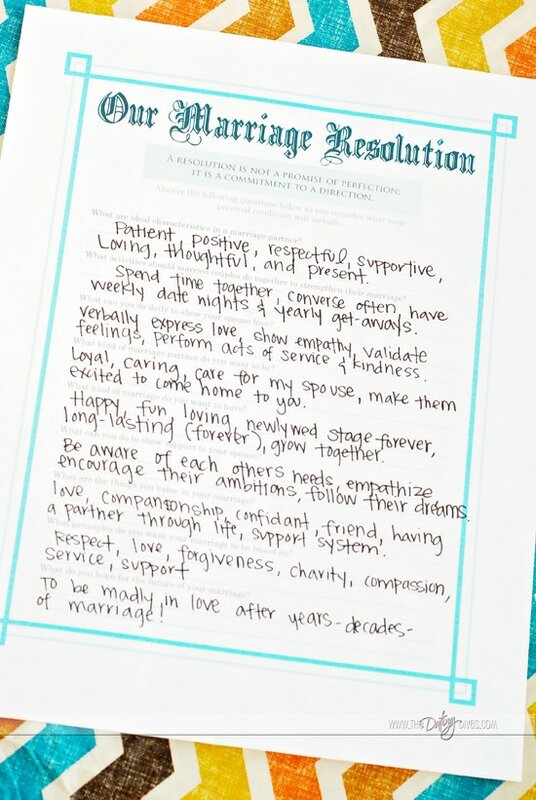 Questions like “What are ideal characteristics in a marriage partner?” and “What kind of marriage do you hope to have?” will generate a discussion that can directly lead you into writing your own resolution! Throughout your discussion, write down your answers. 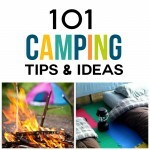 Don’t worry about being formal or having the “right” answers – this is a brainstorm. Write down anything and everything you can think of for each question. 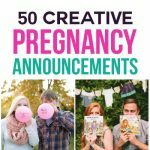 If you need some inspiration check out our Marriage Manifesto which has a lot of great ideas. This is a great time to express your feelings, hopes and desires about your marriage with your spouse! Enjoy listening to each other and looking toward the future together! 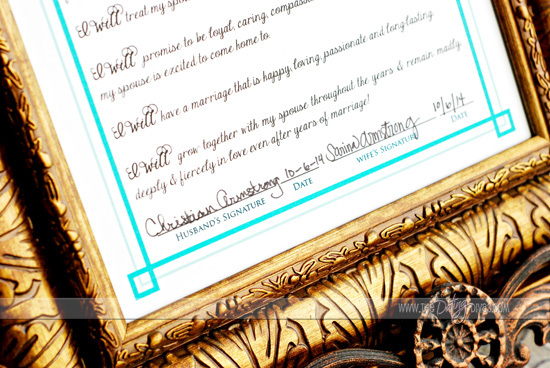 Next, use the Marriage Resolution Template to transfer your brainstorm ideas from the question prompts page onto the template form. In the movie, the resolution statements begin with “I will” followed by a specific commitment. This template also begins with “I will” and allows you space to begin to write your own resolution. For our marriage resolution, my husband and I went question by question and turned each question’s answer into an “I will” statement. 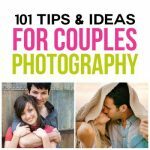 For example, my spouse and I said that we felt like an ideal marriage partner would be patient, positive, respectful, supportive, loving, thoughtful, and present. When we transferred our thoughts onto our resolution draft we wrote, “I will be patient, positive, respectful, supportive, loving, & thoughtful. It wasn’t an exact transfer, but pretty close! Feel free to adjust your ideas as you create your draft and make it how you want it! 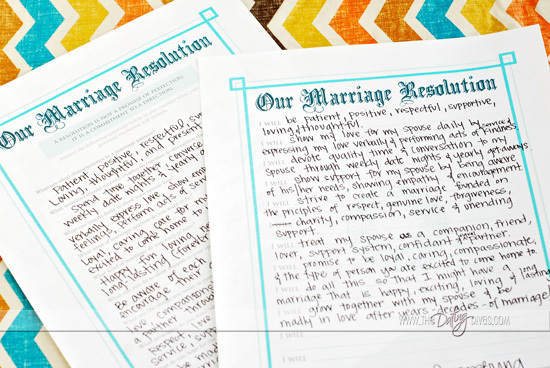 Now, it is time to make your marriage resolution official! 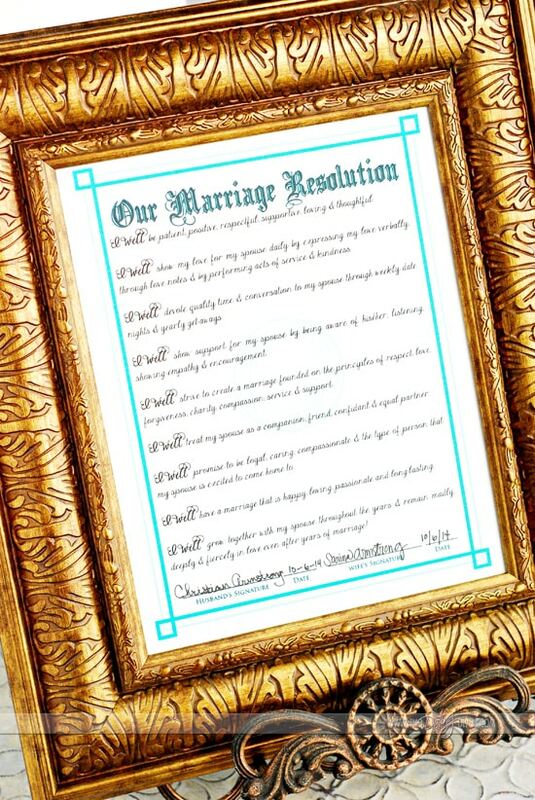 Print the official stationary page of the Marriage Resolution Printable onto nice cardstock paper. Since this is an official document, you want to make it as nice as you can! 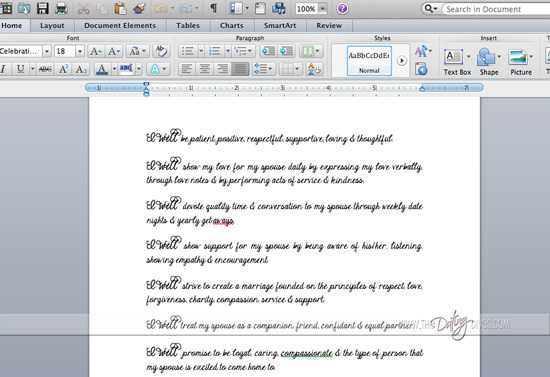 Then, using Microsoft Word (or a similar program) type up the marriage resolution document using your written template guide. To make my document look more formal I used my favorite free fonts: Janda Elegant Handwriting (for the statements) and Janda Celebration Script (for the “I Will” Statements). Then, to make the typed statements fit inside the stationary’s border, I brought in the margins approximately 2″. I then printed out my document (on a separate piece of simple paper) and held it up to the light against my stationary picture. I made adjustments (and went through several copies) until it would fit just right. When I had everything just the way I wanted it, I placed my nice cardstock paper into the printer (make sure it is facing the right way!) and hit print. It turned out beautiful! I put my final draft into a fancy frame to display in our home forever! It will serve as a daily reminder to us of the marriage we desire to have and our specific promises we made to achieve that goal! Since it is a formal document, we also added our signatures as a sign of our commitment to uphold the promises we wrote. 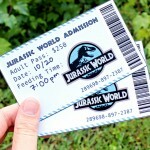 This Date Night idea was so enlightening! To verbalize our ideal marriage goals and to create strong “I Will” statements was very powerful. It was a great moment to reconnect with my spouse and recommit to our marriage in a way that was comfortable and fun! 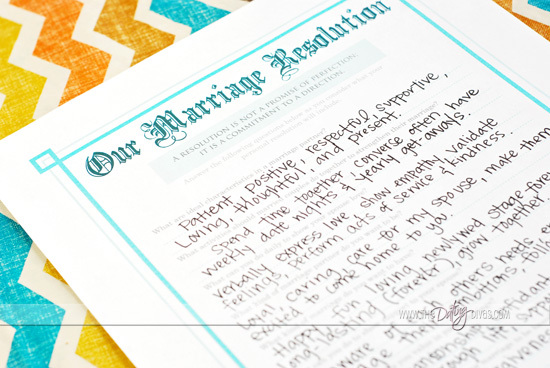 You can get your free “Our Marriage Resolutions” printable right here, just makes sure to send some Diva love to Erin at Strawberry Mommycakes to say thank you! 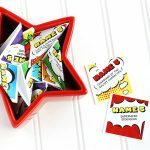 And then go check out our fun Spark Starters. 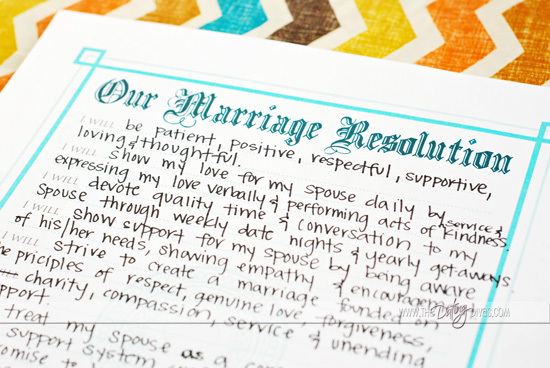 Now that you have a resolution for your marriage, consider making one for your whole family! 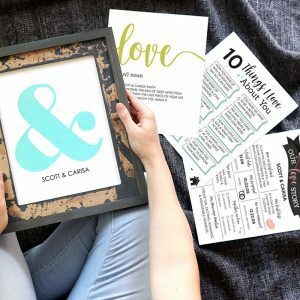 We have some gorgeous printables that will help your family to create their own Family Mission Statement. AND - if you want to see more inspirational movies like Courageous, check out our Fireproof Date Night. This movie is made from the same producers of Courageous! My husband and I are sitting down and making a marriage resolution tonight! Thank you! 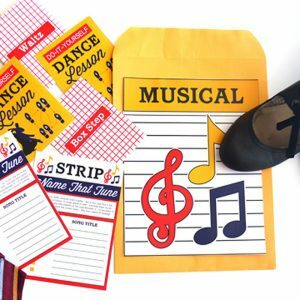 I love how meaningful this activity is! LOVE IT! I love this! Thank you so much! I shared with my Facebook group, rebuilding marriages community. I seriously love this! Now, what to make as finger food? Thank you for letting us know! I am sorry you have experience difficulty in using our site! Yeah, hey, so me and my wife’s marriage is on the rocks. We turned to your “marriage resolution” quiz to help, but we ran into a slight problem. At the end, it asks for the HUSBAND’S signature, but we have two wives!!! Will this work if you are homosexual, or is our marriage doomed forever? Were the republicans right?